It was one of the busiest weekends of the year on local waters as the river and drains season drew to a close and clubs started running their first matches on commercial waters. The Conservative Club fished the Willows at Decoy Lakes which saw a fine win for Terry Tribe from unfancied peg 16. He caught on a long pole line fishing soft expanded pellet. Runner-up was John Newman. He fished short feeding lots of red maggot for 45lb off peg 22, then came Bob Barrett with 39lb 1oz off peg 29. Over on the Horseshoe Pool, Hotpoint started off their season at Decoy with a very respectable result. It saw Tyrone Horn continue where he left off at the back end of last season taking the top spot with 67lb 7oz from peg 10. He caught well in the margin fishing dead reds and pellet. I managed second place from peg two, catching late in the match on red maggot with quite a few fish falling to my maggot line close in and up in the water weighing in 61lb 10oz. Third was Pete Sanderson with 61lb 6oz caught on a small feeder from peg 18. JVAC were also at Decoy. They fished the Oak Pool and Dave Parsons made it two match wins in a row with 141lb 8oz. Fishing peg 10, he caught on the pole with most of his fish falling to a pellet and pole approach up in the water. In second place fishing almost opposite the winner was Chris Saunders on peg 21. He also caught on the pole for 131lb 6oz. Third place went to Chris Baldwin on 81lb 1oz. In the Decoy Over 55s match fished on the Beastie Lake, matchwinner was Paul Morley with 109lb 5oz. He alternated between the pole and feeder. Runner-up was fishery regular Gus Gausden, who caught on the pole with pellet for 104lb 8oz, then came Tim Nash with a level 100lb. By far the biggest match on the Decoy complex was round five of the Tony Evans Winter League series. Rob Taylor topped the strong field from Cedar peg 22 with 140lb 6oz. Mark Goddard came second with 124lb 5oz followed by John Whincup on 113lb 3oz. Haddon Lodge sprung back to life on Sunday after a warm spell of weather appeared to wake the carp up. Top rod with 25lb 8oz was Lucio Melillo. He caught carp, barbel and skimmers on the pole with soft pellet over micro pellets. 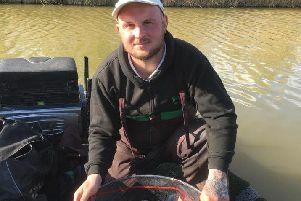 Jason Moore took a net of skimmers and small carp for 19lb 6oz, followed by Tony Moulds on 12lb 8oz. Sport is also starting to pick up at Float Fish Farm Fishery, with carp responding to both a pellet and red maggot approach. In the Saturday Open, Roy Wells fished a small feeder with double dead reds on the hook to win with 56lb 9oz. Vince Hull claimed the runner-up spot, he caught on corn and pellet for 52lb 3oz, then came Stan Dow on a level 38lb.